Richardson graduated from TCC in December 2017 with an Associate of Applied Science in Graphic Design with a Specialization in Multimedia. At Salem High, Grace Richardson was the PowerPoint queen. But she didn’t consider a career in interactive design until sitting in a class at Tidewater Community College’s Visual Arts Center. Richardson graduated in December 2017 with an Associate of Applied Science in Graphic Design with a Specialization in Multimedia. She transferred into Old Dominion University’s five-year bachelor of fine arts program. At Salem, Richardson embraced creating PowerPoints. She was choosy about typography choice and often added animation and color. However, she never linked that passion to a career in graphic arts, initially starting at TCC as a business major. After a year, she discovered the offerings at the VAC, starting with a history class that gave her the “why” behind many of the most significant works of arts. She also took computer graphics, which introduced her to Adobe Creative Suite. It was her first experience using software to design. The grade motivated Richardson even more, and now she cringes at that early work. When she took her second computer graphics class under instructor Heather Boone, she realized where the holes were in her those initial assignments. Prior to taking her first interactive design class, Richardson could not have explained what an interactive designer does. Now she’s immersed in the science of the field; her internship focuses on user interface as it relates to the bank’s mobile app. “Honestly I feel like I have an edge because of the foundation from TCC,” she said. Close-up of Richardson’s Woof Weather app. In a final portfolio, Richardson combined her best work, which was then evaluated by professional graphic designers. Among her favorite pieces: a Woof Weather app created in memory of her beagle hound, Bob Boy. She designed an app that tells dog owners the best time of day to walk their dogs given weather conditions and includes a Facebook component allowing owners to create accounts for their animals and upload pictures. 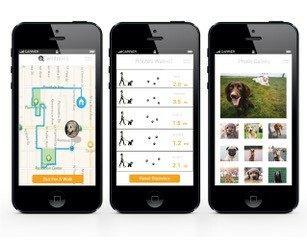 The interactive app connects dog walkers with others in their neighborhood who might also be walking their dogs at the same time and calculates mileage. “I used icons so it could be understood by people speaking any language,” she said.